Understanding Martial Arts - The Macho Blog. Martial arts has evolved over the years into a heavily practiced form of physical exercise and way of life for many people. Its practice promotes discipline and confidence, teaches self-defense skills, and helps students build a more centered and balanced life. It also requires a combination of meditation, self-awareness, and repetition of movements to fully master the craft. 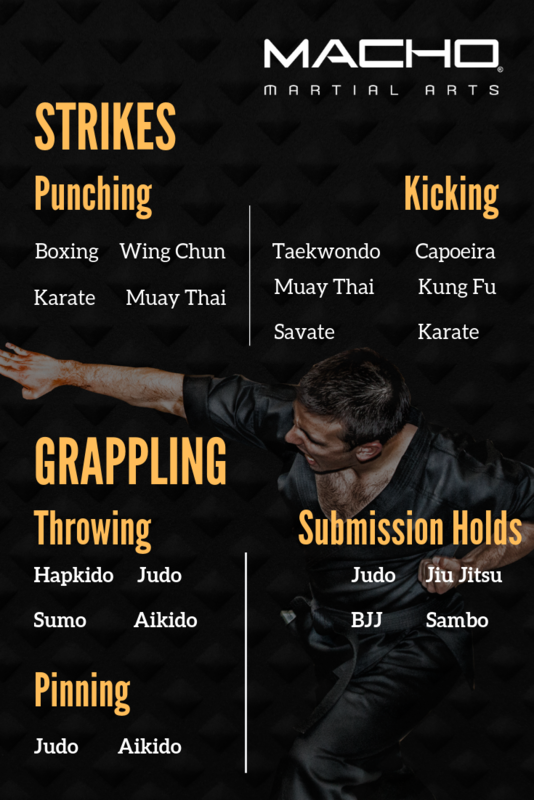 However, despite many differences in origin and style, there are some basic moves shared by almost every form of martial arts that students learn when training. Encompassing these moves are two overarching themes that make up the whole of martial arts: unarmed and armed combat. Unarmed martial arts can be grouped into practices that focus on grappling, striking; stand-up fighting, and ground fighting, while armed practices are defined by the types of weapons used. Below is a list of the most common movements in unarmed martial arts and the practices they belong to. Armed martial arts is an exciting sector that encompasses a wide spectrum of weapons. Those who choose this path seek mastery in their weapon of choice, and draw on traditions such as: eskrima, silat, kalaripayat and kobudo, which are all variations of martial arts that focus on weapons-based training. The most common weapons chosen by martial artists to practice with are swords, shinais, sais, bokken, bos, escrima, tonfas, and kamas, although there are many more to choose from. Testing and competition is another important aspect of martial arts, and is where the belt ranking system comes into play. These tests are undergone by students who wish to take their practice to the next level, and they only move on when their master believes they are ready. Once the student has indicated mastery of their current level, they are allowed to move on to the next and their achievement is recognized by a new belt color and/or title. If you are new to the world of martial arts and still need some more information before you choose a path, feel free to look through our blog. We aim to provide as much information as possible to beginner and advanced martial artists alike, and are looking forward to helping you on your journey!